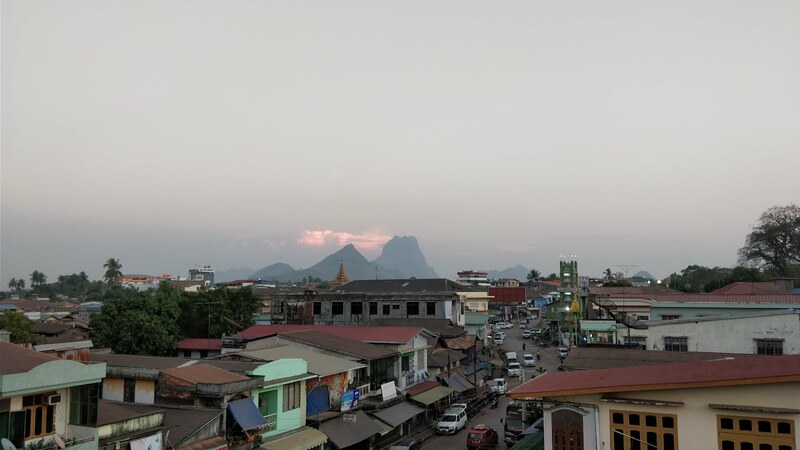 After checking out the following morning, we got the bus from just around the corner from our motel after our host wrote out directions and the place name of Hpa-An in Burmese to help us out. It was an old local bus with no air-con, but luckily the front door didn’t close and windows could open, plus we got seats right at the front so the journey wasn’t too bad at all. 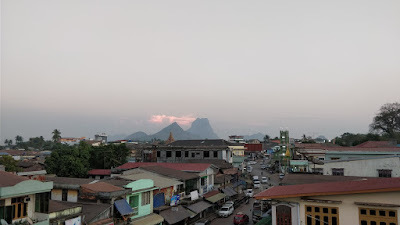 We arrived around 2 hours later in the town of Hpa-An which is in the Kayin State, and after a 5-minute walk in the mid-day heat, we reached the hotel for our last 3 nights here in Myanmar. The Galaxy Motel is near the centre of town and a popular stop off for travellers both arriving and departing due to its proximity of the border crossing of Myawaddy to/from Mae Sot in Thailand. 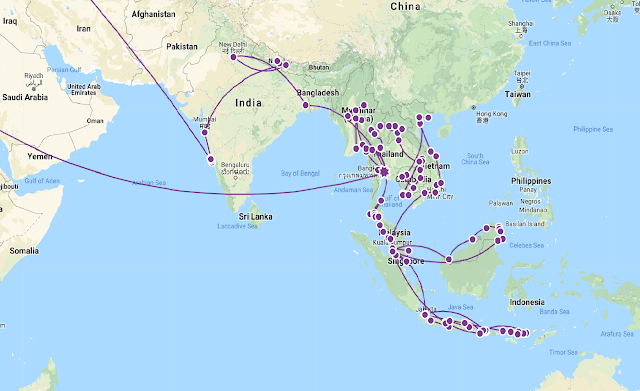 That was our plan, to stay a couple days here exploring the area and then head over to Thailand before heading south. 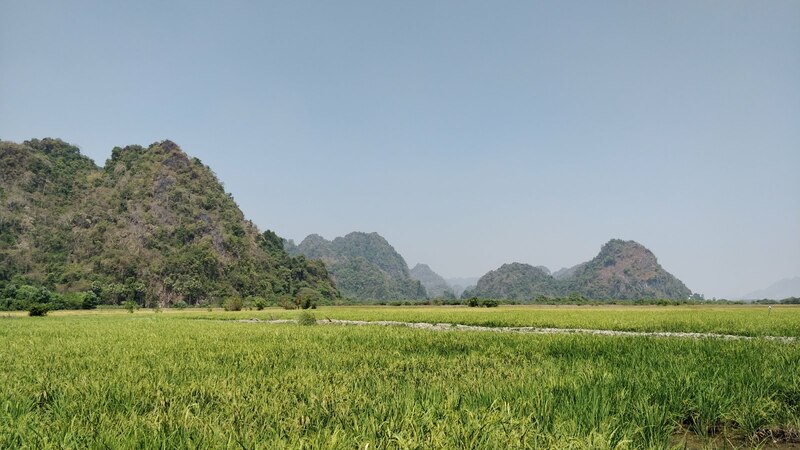 The drive up here had amazing scenery with lush green hills all around and lots of ridges with pagodas and temples on the summits, some of which looked impossible to reach. 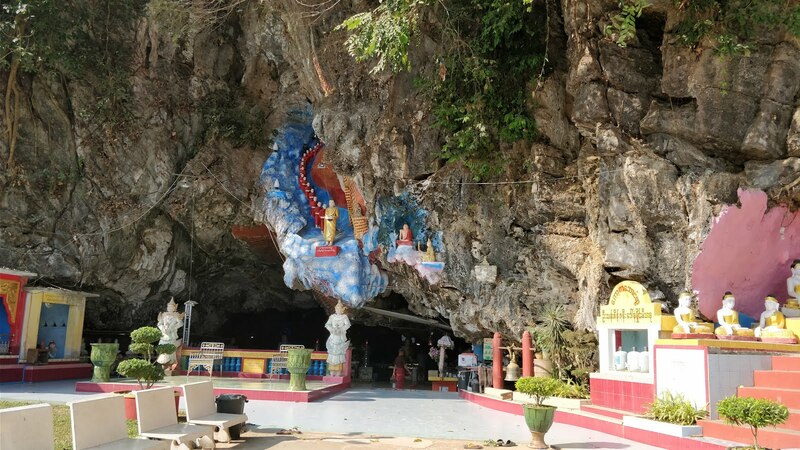 The area is well known for its caves and bats, and we couldn't wait to explore some of them during our time here. That afternoon was spent looking at our next destination Thailand, then in the evening we went out for a few beers at a restaurant called Lucky 1 which is recommended by our hosts. Cheap beers are what they advised us, and yes at 800 kyat a pint (43p), we had a few. However, we decided to eat at another restaurant this evening though, so we went to a place called Wadee which we had found on Tripadvisor. We were hungry after travelling all day, so ordered a couple of starters, a couple of mains with rice and a potato salad and of course a couple of beers. Then we added on 1 dessert and another beer and when we got the bill, it came to around £9 in total which is the cheapest meal we have had in this country. Plus, the food was great, and so much so we headed back there on the last night too. 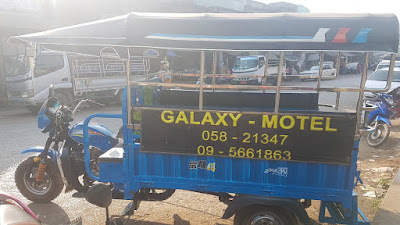 We had arranged with the lovely Kim who runs the hotel to go on an organised tour the following morning, so after breakfast around 8am we, along with 3 French tourists got loaded into a tuk-tuk and we quickly headed out of town to our first of 7 destinations that day. There was also another tuk-tuk full of guests from the hotel, but we only seen them briefly at a couple of the places. The French we were sharing with were a nice group and had another 3 weeks here in Myanmar, so I assume they have not long arrived, but have been here previously. 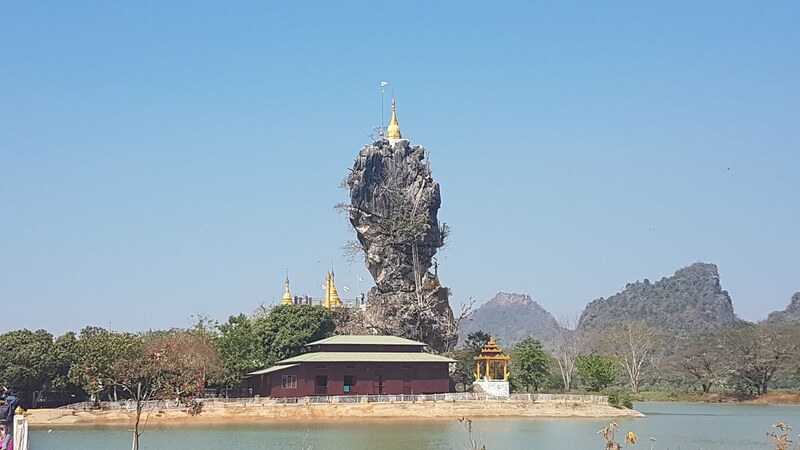 The day mostly consisted of being driven round some of the main caves in the area, most incorporated temples and Buddha images, some spectacular and some not so. We had a lunch stop where we managed to grab a beer, but by mid afternoon we were both a bit hot, dusty and tired but the highlight of the day was still to come. And around 6pm we went to what is known in the area as Bat Cave. 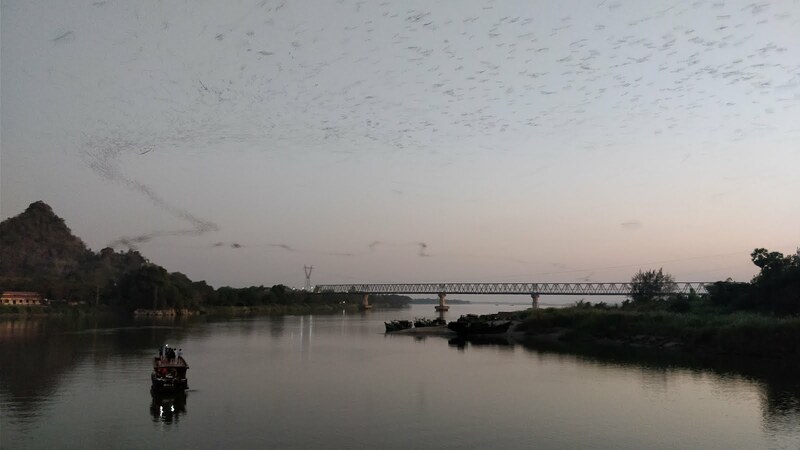 This place is home to an estimated 400,000 bats who every evening at dusk all swarm out from inside the cave and head along the river towards Mawlamyine. This is a spectacular experience as they all fly out and lasts for over 20 minutes, and after that it was time to head back to the hotel for a much-needed shower. That evening it was back to Lucky 1 for yet more cheap beers, but this time we decided to eat here and had some amazing Chinese food with a special mention to them deep fried chicken balls and fried pork ribs. 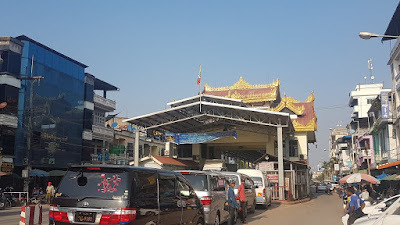 Our last full day in Myanmar was a quiet one, quick trip to the supermarket in the morning then an afternoon of checking out places to see and stay at in Thailand. This is proving more difficult than we thought as we hunted down what type of accommodation we could afford, in the locations we wanted with the facilities we both wanted. That evening we went back to Wadee for yet more amazing food, I had Chicken Tomyam and Sadie had a delicious Thai Green curry plus we had a couple of starters and seafood rice for another £7. Back to Lucky 1 for a few beers then yet more hunting for somewhere to stay in Ko Tao. This was proving difficult, so much so we have decided to check out another of the islands instead. The next morning, we had a shared taxi booked to take us the 4-hour journey to Myawaddy. It turned up just after 11am, a nice 7-seater A/C people carrier. We were the first 2 in, but after another couple of pick ups, it was soon full. Eventually we head out of Hpa-an around midday towards the border. 90 minutes into the journey, there was a loud knocking noise coming from the rear left wheel. The driver jumps out to inspect it, gets back in and a few phone calls later we carry on slowly for another 20 minutes before pulling into the side of the road which was a makeshift garage. We all get out and a few people start working on the car. It turns out the shock absorber snapped but after a makeshift weld repair, we get in and off we went again. A couple of hours later, though a bit less than we thought due to a new winding road that’s been built over the mountains, we arrived at Myawaddy and got dropped off just near the immigration desks. We were quite excited about doing this crossing by land after reading about it and seeing pictures of this beautiful bridge. However it was all a bit dissapointing and after around 30 minutes, we had fully crossed over the ‘Friendship Bridge’, grabbed a well-deserved beer and then got a taxi/bus to our hotel for the night. For the night, we stayed at the Hop Inn, which is basically a Thai version of a Travelodge, but the bed was so comfy and we both slept well before our flight early the next morning. But not before we went to the restaurant next door for pizza and garlic bread with cheese, a western dish we hadn’t had since away back in Pokhara! 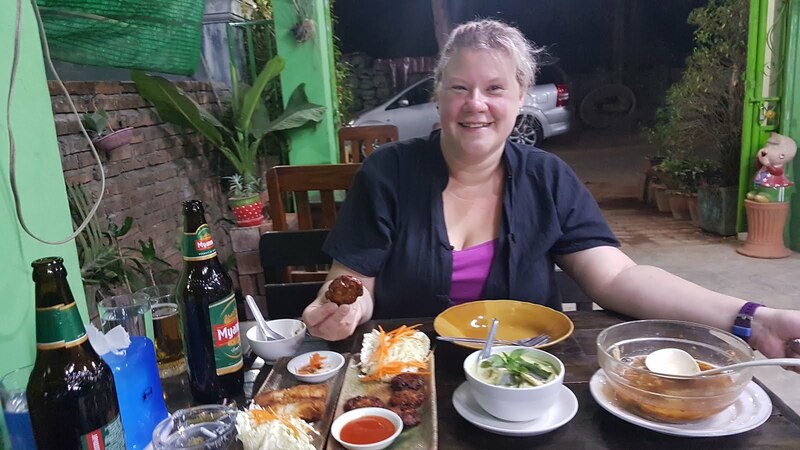 We have had some amazing dishes of food served to us during our 4 weeks in Myanmar, so we can’t complain at all, plus neither of us has had any dodgy guts or illness thankfully so long may that continue into Thailand.